On Lovina’s birthday, another summer wedding gets “published”! It is 6:42 a.m. and our three youngest just left with the bus for another day at school. They are counting the days left of this term. Eight and one-half days left! I still have a hard time getting used to the bus coming this early. All the years our children went to school the bus was never here until 7:00 a.m. or a little after. Changes are hard to get used to in our lives! Talking about changes in life. Our family will have another change and I’ll probably have the hardest time with it. On the other hand, I’m excited and happy for daughter Susan, 20, and her special friend, Mose. They were published in church this past Sunday to announce their wedding date. They picked Friday, August 5, for their special day. Mose and Susan have been dating for four years and we have no doubt in our minds that he will be a good husband to our daughter. He seems like my own son and I hope that never changes. It is so much easier on a couple if both families accept the life partner of their family member. May God bless their marriage and grant them many happy, healthy years together! With the wedding coming up I see busy months ahead! We will be more organized than with Elizabeth and Timothy’s wedding. We were in the process of putting up a pole barn last year which delayed all the other work. Susan’s dress for the wedding is mostly finished. The rest of ours are cut out but still waiting to be sewn. That is what I plan to do the next few days. I feel better to sew now since our whole garden was planted Saturday. We are enjoying radishes and green onions from the early things we planted. Mose and his brother Freeman assisted us with our work on Saturday. The pole barn was organized and cleaned up. When it gets closer to the wedding we want to wash down the walls and ceilings on both sides of the pole barn. We will set tables in both sides and open the garage door that’s in the middle. Mose and daughters Susan and Verena planted flowers in my flower beds. We put out 68 tomato plants. With everyone’s help the garden was quickly filled. Now it’s up to our good Lord to provide sunshine and rain to make things grow. Some years we have a bountiful crop and others not much but we want to take what “He” sends. On Sunday, May 22, I also turned another year older. We had communion services at sister Emma and Jacob’s house. After the services were over everyone sang “Happy Birthday” to me and sister Emma brought out a cake with candles. Luckily she only had a four and five for candles. I don’t know if I could have handled blowing out 45 candles. Emma sent the cake home with me. We had it for supper with our children. The children went after pizza in town and they grilled hot wings so I wouldn’t have to cook on my birthday. We had a nice evening together! On Thursday we traveled to Berne, Ind., to brother Amos and Nancy’s house for the wedding of their daughter Lovina and Benjamin. They had a very nice day! On the menu were fried chicken, mashed potatoes, gravy, noodles, dressing, mixed vegetables, lettuce salad, sliced cheese, homemade bread, butter and rhubarb jam. Also pies (rhubarb, blueberry, cherry, and pecan), tapioca pudding, angel food cake, fruit cocktail dessert, and of course “nothings” were on all the tables. Sausage was added in the evening. It was nice to see a lot of family again. On a sadder note; Friday, May 20, brought memories of the passing of my dear father, Ben Coblentz, 16 years ago. How nice it would be to have my parents at all their grandchildren’s weddings. God’s ways are not our ways so we need to accept what He sends to us. I must get busy. I love sewing but it’s different if you have a deadline to get things done. It kind of takes away the enjoyment, but we will take one day at a time. God’s blessings! Drain juice from fruit cocktail; add water to the juice to make 3 cups of liquid. Put in a saucepan. Add pudding and bring to a boil. Add Jell-O and cool; add fruit cocktail. Many congratulations to Susan and Mose: may you have a long, happy and healthy life together, surrounded by those you love. Thank you so much for these good words! My congratulations to Susan & Mose. May they have a long happy marriage. I agree with you on the garden, the past two years mine hasn’t been good. This year maybe will be better. 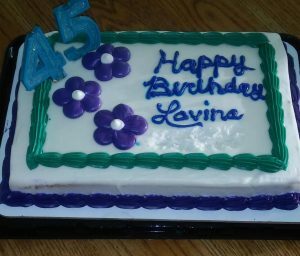 Thanks for all your comments for Lovina. Here’s to a better gardening year! My congratulations to Susan and Mose too. I wish you all the best for a wonderful and happy life together. Very sweet to add your good wishes. We’ll all be following the developments anxiously! 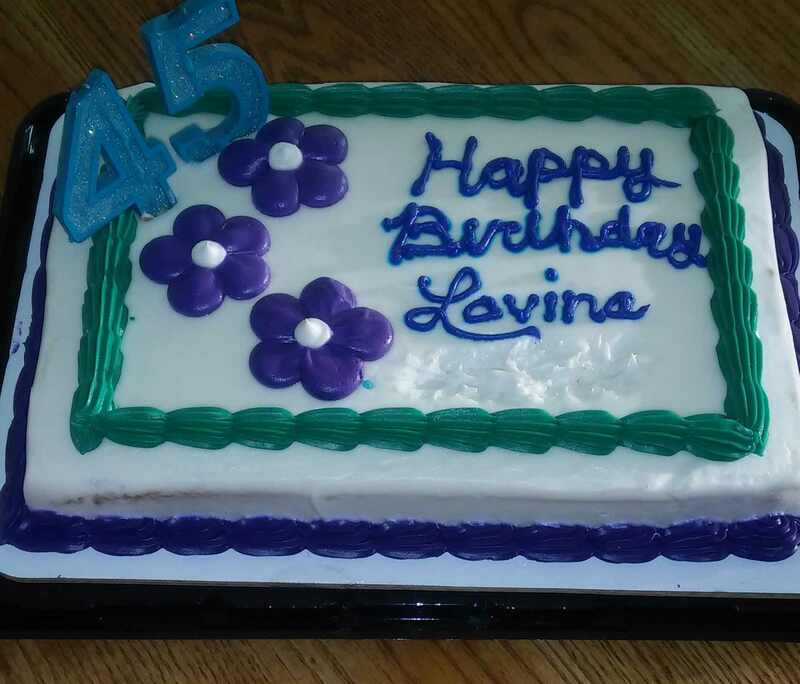 My wonderful sister Sandy introduced me to Lovinia’s column while I went thru breast cancer treatment in 2012. She lives in Ohio, I live in Iowa and she saves the paper for me till we have sister visits. There are six of us. I have gotten a glimpse into Lovinia’s loving active family and would join others in wishing Susan and Mose the best of wishes for their upcoming marriage. God’s blessing on the entire family.